Haq's Musings: Latifullah Mehsud Arrest Led to Killings of Hakimullah and Haqqani? Latifullah Mehsud Arrest Led to Killings of Hakimullah and Haqqani? Tehrik-e-Taliban Pakistan's Deputy Leader Latifullah Mesud's arrest in October by Americans in Afghanistan was soon followed by the killing of TTP leader Hakimullah Mehsud in North Waziristan and the assassination of Haqqani Network's Naseeruddin Haqqani in Islamabad. Are all three of these events connected? It now appears from various reports that Latifullah Mehsud was working closely with the Afghan intelligence to carry out terrorist attacks across Pakistan. But Latifullah and Hakimullah were also in contact with Naseeruddin Haqqani to communicate with Pakistani government to plan peace talks. Apparently, Latifullah had been working for Afghan intelligence for several months which has now been acknowledged by the Afghan government. It is also known that Afghan intelligence has close ties with Indian intelligence. Latifullah's arrest and interrogation helped Americans track down both Hakimullah Mehsud and Naseerudddin Haqqani who were wanted for the murder of American spies and soldiers in Afghanistan. Americans also wanted to disrupt both the TTP and the Haqqani network because of their close collaboration with Al Qaeda in Pakistan to plot attacks against western targets. Such collaboration in the past has resulted in the deaths of several CIA agents at Khost forward operating base in Afghanistan, deaths of hundreds of NATO troops, and Pakistani-American Faisal Shehzad's failed attempt to bomb Times Square in New York. Hakimullah Mehsud killed; Reaction in Pakistan; India’s Mars mission from WBT TV on Vimeo. Viewpoint from Overseas host Faraz Darvesh discusses with Riaz Haq (riazhaq.com), Sabahat Ashraf (iFaqeer; ifaqeer.com) and Ali Hasan Cemendtaur Hakimullah Mehsud’s killing in a US drone attack and the reaction in Pakistan, why PTI wants to stop NATO supply; and India’s mission to Mars. This show was recorded at 1 pm PST on Thursday, November 7, 2013. פקיסטן, קראצ'י, קליפורניה, הטליבאן, האיסלאם. Malala Moment: Profiled in Courage...Not!! Terrorism is the product of a simple mind. For a terrorist, the gun is the only remedy for all ills. Terrorists do not need to kill many people as a few can terrorise millions by killing 50 ordinary people and one high profile personality occasionally. The mightiest institutions could be made subservient; at least this is true in case of Pakistan. Look at how obediently all known leaders compete with each other in appeasing terrorists. Terrorism appears to give quick results and terrorists glorify their nefarious success. This must be a very empowering experience for a terrorist. But this is just a farce and they delude themselves by living in it. As the Taliban's cease-fire ended on Thursday, the internecine bloodshed has created a new hurdle in the talks process. "Our interlocutors are badly split. Unless they can resolve this quickly, things aren't looking very bright," Rustam Shah Mohmand, one of the government representatives at the negotiations, told The Wall Street Journal. "The government is also dragging its feet." "It appears that we're losing momentum. I fear that we're heading toward a dead end." People with knowledge of the Pakistan army say the institution has concerns about the way the talks are dragging on. Meanwhile, the U.S., which has targeted militants in the tribal area, has ceased drone strikes against the Pakistani Taliban since the negotiations policy was set, under an understanding between Islamabad and Washington, officials say. No talks have been held between officials and the Pakistani Taliban for over a week. The group has made demands—such as the designation of a safe area for the militants where security forces won't attack them and the freeing of hundreds of their prisoners—that the government will find politically hard to meet, while offering little in return. The talks have decreased but not stopped attacks. A market was bombed on the outskirts of Islamabad on Wednesday, killing at least 21 people. The Pakistani Taliban denounced the bombing, saying it was wrong to target civilians. It is unclear whether one of its own factions carried out the attack. Militants and officials said the Haqqani network, an Afghan insurgent group also based in Pakistan's tribal areas, is trying to patch up differences between the warring Taliban factions, which come from the Mehsud tribe. The Haqqani group has repeatedly intervened in internal Taliban disputes, fearing that such fighting will impede its ability to use the tribal areas as a sanctuary, analysts said. "The Taliban shura [leadership] will now find it more difficult to come to a unanimous view," said Rahimullah Yusufzai, a veteran journalist who was formally part of the government negotiating team. "They will not give up on the option of talks at this stage. Both the Taliban and the government want to continue talks." The infighting involves a faction led by Khan Said, known as Sajna, and a rival group led by a commander called Shehryar over leadership of the Taliban's powerful Mehsud wing. The conflict dates back to the enmity between two Mehsud commanders who were killed by U.S. drone strikes last year. Their deaths led to a militant outside the tribe, Mullah Fazlullah, taking control of the Taliban for the first time. Last week, Pakistan’s chief military spokesman said something extraordinary — something that could signal a sea change in the country’s security policy. Which makes it all the more perplexing that the international media has given scant coverage to what the spokesman had to say. If this is in fact true, then it is great news. Pakistan’s security establishment has long refused to act against the Haqqani network. It has regarded the group — as it does other militant organizations that don’t launch attacks in Pakistan — as a strategic asset, in that it helps limit the activities of archenemy India in Afghanistan (Haqqani fighters have frequently targeted Indians in Afghanistan). In 2011, Mike Mullen, the then-Chairman of the Joint Chiefs of Staff — and hence the top U.S. military official — famously stated that the Haqqani network “acts as a veritable arm” of Pakistan’s main intelligence agency, the ISI. By declaring war on the Haqqani network, Pakistan could seriously degrade one of the most destabilizing forces in Afghanistan. It could also be a tremendous boost to India-Pakistan relations (New Delhi has long criticized Pakistan for not cracking down on the various Pakistan-based organizations — from Lashkar-e-Taiba to the Haqqani network — that mount attacks on Indians). And, of course, it could also greatly improve U.S.-Pakistan ties (it bears mentioning that just days before Bajwa’s announcement, high-level Pakistani military officials held meetings at the Pentagon). Still, let’s not get too excited. First, U.S. officials allege that Haqqani network commanders were tipped off by Pakistan about the North Waziristan offensive, and have fled the area. If true, this suggests the military’s announcement could be mere spin, and that its policy toward the group hasn’t changed. It’s easy to talk tough about targeting your strategic asset if you’ve already ensured it won’t be harmed. Second, Bajwa’s language was telling. “Whoever challenges the writ of the state will be taken to task,” he said. In fact, the Haqqani network doesn’t do this because it doesn’t target the Pakistani state. This language is reminiscent of Pakistani threats earlier this year to launch operations in North Waziristan against “anti-state groups” — clearly a reference to the likes of the Pakistani Taliban, not the Haqqani network. Third, from a strategic perspective, it’s a strange time for Pakistan to turn on the Haqqani network. With much uncertainty (and more instability) likely to set in amid the NATO troop drawdown in Afghanistan, wouldn’t Pakistan want to tighten its ties with its old reliables? And particularly those long-time assets used to project influence and promote Pakistani interests in Afghanistan? Bajwa’s statement was encouraging. Whether it was genuine, however, remains to be seen. Pakistan will go after all militant groups in its unfolding operation in the North Waziristan tribal area, including insurgents who target neighboring Afghanistan, in what would be a major shift in policy, the defense minister said. The minister, Khawaja Muhammad Asif, told The Wall Street Journal that the military offensive in North Waziristan would target the Haqqani network, a group affiliated with the Afghan Taliban that has been based in the tribal area for more than three decades. The Haqqanis are seen by the U.S. and Afghan governments as one of the main threats to stability in Afghanistan. Pakistan launched its offensive in North Waziristan with airstrikes three weeks ago, moving on to ground operations on June 30. North Waziristan, part of Pakistan's wild tribal areas along the Afghan border, is a sanctuary for Pakistani Taliban, Afghan insurgents and al Qaeda. Washington has pushed Islamabad for years to take control of the region. "We will eliminate all sorts of terrorists from our area without any exceptions," said Mr. Asif. "If there are exceptions made, then the purpose of this operation will be defeated. 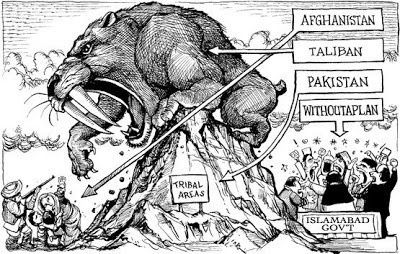 It has to be without making any differentiation between our Taliban and their Taliban, or good Taliban and bad Taliban." Pakistan has long been accused by neighbors and U.S. officials of backing jihadist groups as its proxies in Afghanistan and India. Some Pakistani officials in the past have described the Afghan Taliban and some other jihadist groups as "good," while the government combats the more extreme "bad" militant organizations that turned on the Pakistani state. In particular, Washington and Kabul have repeatedly accused Pakistan of supporting the Haqqani network. But Mr. Asif insisted Pakistan has changed its policy. "They are all bad Taliban. There are no more good Taliban," he said. Islamabad is trying to persuade Kabul to attack Pakistani Taliban groups that have taken refuge in eastern Afghanistan before and during the North Waziristan operation. Afghan authorities have indicated they won't act unless they see Pakistan fighting Kabul's enemies, such as the Haqqanis. "If we have to get rid of these people, we have to get rid of them in totality, because this is something plaguing this area for three decades. Both sides of the Durand line, Pakistan and Afghanistan, we are in dire trouble," said Mr. Asif, referring to the border with Afghanistan. However, such claims in the past of a tougher approach to militancy have been met with skepticism inside and outside Pakistan. Saifullah Mahsud, director of the FATA Research Center, an independent think tank in Islamabad, said that according to his information, the Haqqani group had left North Waziristan before the operation. "Pakistan has the opportunity of establishing its writ in North Waziristan now and stopping militants returning there," said Mr. Mahsud. The U.S. military in Afghanistan says it has handed over three Pakistani detainees to Islamabad, including one who Pakistan intelligence officers say is a senior Taliban commander. The U.S. did not name the prisoners but two Pakistani intelligence officials say Latif Mehsud was among them. The officials spoke on condition of anonymity because they were not authorized to speak to the media. The U.S. said in a statement Sunday that the transfer happened Saturday. Mehsud’s transfer underlines improving relations between the U.S., Pakistan and Afghanistan. Pakistan has long demanded that Afghanistan hand over militants operating in its territory, and the issue was a source of sharp tension between Pakistan and former Afghan President Hamid Karzai. Mehsud was captured in October of last year. More than two years after its pioneering Mars Orbiter Mission (MOM) reached the red planet, the Indian Space Research Organization has yet to release highly anticipated measurements of atmospheric methane, a gas which on Earth is strongly tied to life. Seeker has learned that the data will never come, due to a flaw in the sensor design. "They did not design this properly for the detection of methane on Mars," Michael Mumma, senior scientist at NASA's Goddard Space Flight Center, told Seeker. In 2003, Mumma led a team that made the first definitive measurements of methane on Mars using an infrared telescope in Hawaii. The methane, which appeared in plumes over specific regions of Mars, reached a maximum density of about 60 parts per billion. "The (MOM) instrument is beautifully engineered, but not for the methane task. It has other value, but unfortunately they will not be able to provide measurements of methane at the levels needed to sample even the plumes we saw," Mumma said. The problem has to do with how the instrument collects and processes detections of methane in the atmosphere, a technique known as spectroscopy. "Imagine that you hold your hand in front of you and extend your four fingers … Suppose that each (finger) represents a methane line. What they have is a spectrometer that can be shifted to … sample each one of the four fingers and then they have a second one that samples the region between the fingers. "The trouble is they don't actually send back the spectra. What they send back is the two numbers — the sum of the fingers measured by the first channel and the sum of gaps measured by the second channel — and then they take a difference of those two numbers and they think that that's going to be the methane signal," Mumma said. "The problem, of course, is that when you have other spectral lines … like carbon dioxide lines which vary widely with temperature in terms of their intensity, then those two numbers … don't represent methane alone. The net effect is that there is no way that one can back out those two signals in order to retrieve a methane signal," he said. "It's really unfortunate because they succeeded so spectacularly well in placing the spacecraft into orbit at all, which was the major achievement for the first try," he added. "But the reality is we won't seeing any detections of methane from the Mars methane sensor on MOM." Mumma and colleague Geronimo Villanueva, also at Goddard, analyzed the MOM methane instrument design as part of NASA's widening partnership with ISRO. Their findings were presented to the Indian space agency ISRO in February. "I believe the resolution is that the Indians now agree that their methane sensor is better used for other purposes, so they are now calling this an albedo mapper and measuring reflected sunlight. It does that, and it does that well," Mumma said. "The engineers know how to build a good instrument. That's not the issue. The problem is they didn't have the scientific guidance needed to tell them exactly what they needed to do," he said. Seetha Somasundaram, with ISRO's Satellite Center which designed the instrument, declined to comment and referred Seeker to ISRO spokesman Deviprasad Karnik. Karnik did not responded to requests for comment. Mumma and other scientists are now pinning their hopes on getting Mars methane measurements from Europe's newly arrived Trace Gas Orbiter. Voyaging to Mars has captured the imagination of many Americans and inspired billionaires to talk of interplanetary colonization, but unfortunately, it makes little economic or scientific sense. My colleague Andrea Rumbaugh reports from SpaceCom that "NASA wants to get people to Mars in the 2030s." While that's a romantic marketing tool to convince the public to pressure Congress to boost NASA's budget, it makes no sense when robots and virtual reality devices can do the job better, cheaper and safer. Admittedly, this is a raging debate in scientific circles, but one the public needs to join in. There are even some serious questions about the value of the experiments underway on the International Space Station, not to mention the logistical challenge of sending humans on a three-year trip to Mars and back. Folks who want to go to space believe that only humans can truly explore, and that machines are a poor substitute. Yet robots are growing so sophisticated, and so capable, that many believe they will exceed human capabilities, just as no human can beat a computer anymore at playing chess, or the much more complex game called Go. U.S. Air Force pilots on the ground in Nevada fly spy planes all over the world, 24 hours a day. The technology is so good that last year Secretary of the Navy Ray Mabus said the Lockheed Martin F-35 Joint Strike Fighter "almost certainly will be, the last manned strike fighter aircraft the Department of the Navy will ever buy or fly." Virtual reality goggles are also getting very good at giving people the sense of being outside their bodies. The right equipment mounted on a robot on another planet could allow every human on earth with Internet access a chance at feeling like they are on another planet. So why go the expensive, manned spaceflight route? What often goes unstated is the role of business in lobbying for the most expensive space program possible. In an era of low defense spending, companies like Boeing and Lockheed Martin are looking for new government contracts to boost their bottom line. The Apollo program cost the United States $275 billion in today's dollars, and a single flight of the space shuttle cost $450 million, the main reason the program was discontinued. Boeing and Lockheed made fortunes on the programs. The Mars Curiosity Rover cost $2.5 billion and is doing great work using fairly dated robotics and sensors. The same mission today could accomplish much more and cost less. In comparison, a manned mission to Mars is conservatively estimated to cost $100 billion. NASA could send 40 robots to many planets for the price of one manned trip to Mars. NASA supporters like to talk about the technological benefits of spin-off technology. And that's perhaps the most compelling argument for sending robots and using virtual reality instead of sending humans. Both technologies have broad application in earth's economy, ranging from virtual trips to the Amazon to self-driving cars. The principal hurdle specifically to India’s entry, however, are the two countries the Indian government in the new Century, helmed by both the BJP and the Congress party, has bent over backwards to appease — the United States and China. The Trump Administration has made it plain it supports only a “modest” increase in permanent seats. This by way of saying that Washington would happily countenance its treaty allies, Japan and Germany, in the UNSC but not India or Brazil — though to the Indian PM’s face US functionaries have assured support. China, on its part, has declared it is against “arbitrarily launching text-based negotiations” in IGN as demanded by India; the larger reason, of course, is to deny both its Asian rivals a leg up. Again, Beijing does not say it’s not for India at the high table but hints at its unwillingness to see Japan in the Council, knowing fully well that no move will ever be made to just ease India’s entry into UNSC. India’s yearning for a permanent seat in the Security Council raises the pertinent question whether India deserves it. Because the five current permanent members (P-5) — US, Russia, China, UK and France are great powers and have traits in common (including the last two which are long into the imperial dusk). They all have hefty nuclear forces, modern militaries to reckon with, are security providers with extra-territorial military presence, with France even in the Indian Ocean (on Reunion Island in the French Indian Ocean Territories and the Heron base in Djibouti), generate advanced technologies in all fields and are frontline technology innovators, have a whole bunch of Third and Fourth World states the world as arms dependencies, courtesy vigorous arms sales schemes, are large foreign aid donors with extensive and tested development and infrastructure assistance programmes, high volumes of global trade and extremely strong and active economies, and relatively high standards of living. So, does India, other than possession of simple, low yield, nuclear weapons (that in quality, perhaps, lags behind a lowly Pakistani arsenal), meet any of these metrics? Our case rests on the following arguments: that India (1) boasts of a large fraction of the world population, (2) is a “responsible state”, (3) is a longstanding democracy and an exemplar of liberal values (4) contributes disproportionately to UN peacekeeping missions, (5) shaped the post-WWII international system by championing anti-imperialism, anti-colonialism and anti-racism, (6) is a steadying influence in a disordered world, (7) has always taken taken the lead role in furthering universal good — disarmament, climate accord, solar alliance, etc., (8) has never been expansionist or coveted foreign territories, but has no neighbour at peace with it, and (9) is a trillion dollar economy, except 40% of its population is below the poverty line. But India, alas, has no Dengxiaoping, no leader to challenge the world and motivate the Indian people to work for the nation’s cause, only gasbags furthering their advantage in domestic politics while using India’s democracy as an excuse for the country remaining a perennial also-ran. Surely then such a country cannot credibly ask in good faith for a permanent seat in UNSC to preside over a world it had no role in making, and has even less of a role in running. The P-5 have to feel sorry enough for a “flailing” India to accommodate it, which won’t ever happen. 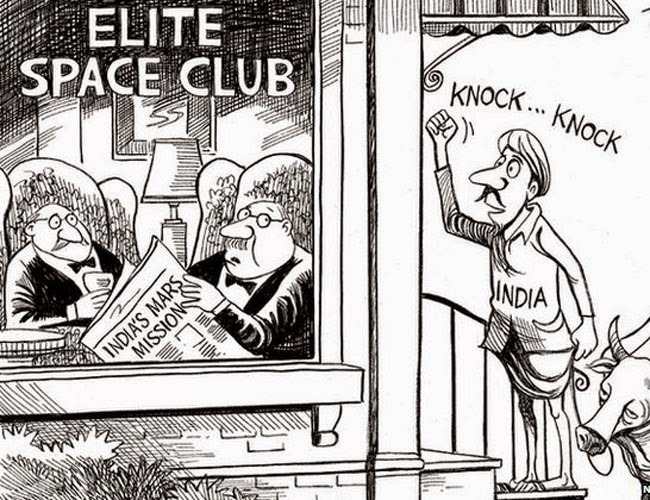 So India is fated to remain on the outside, like a beggar with face pressed to the windows of a posh eatery.